The i30 N is Hyundai Motor’s first high-performance car under the N line up. Built on the New Generation i30, the i30 N has been developed from the ground up to deliver maximum driving pleasure in everyday life on the road, as well as on the track. N was born in Namyang, at Hyundai Motor’s global R&D Centre in Korea, and honed at the Nürburgring, one of the most challenging race tracks in the world and home of Hyundai’s Testing Center. The N logo symbolises a chicane, the ultimate corner where the i30 N has been tested thoroughly and has proven its ability. The i30 N is inspired by Hyundai Motorsport’s experience in WRC since 2014. The i30 N is Hyundai Motor’s answer to emerging customer preferences towards uncompromising innovation and technology-driven performance. Due to be launched across Europe by the end of 2017, the All-New i30 N is made for people to experience a contented grin when driving a performance car. Part of the i30 range, the i30 N sports a unique character and coherent, timeless design – including the Cascading Grille at the front, the new Hyundai signature, which is characterised by a downward tapering gesture inspired by the flow of molten steel. 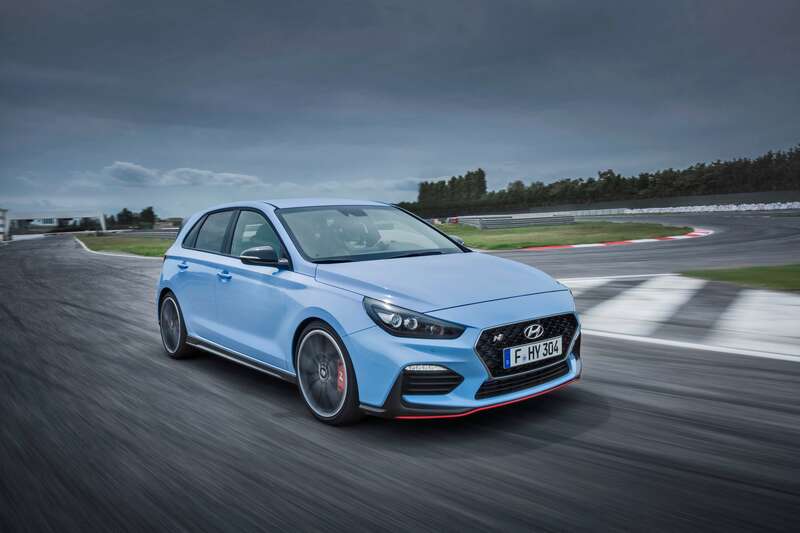 The i30 N has been developed on the basis of three corner stones under the theme ‘Fun to Drive’: Corner Rascal, Everyday Sports Car and Race Track Capability. The i30 N has been developed to make the driver’s heart beat faster when he or she gets behind the wheel. Instead of focusing on pure numbers, Hyundai Motor has chosen to emphasise driving pleasure and the emotional impact on the driver’s heartbeats per minute (BPM), rather than simply measuring revs per minute (RPM). When the driver hits the throttle and shifts through the gears, the Rev matching function supports smooth gear shifting, while the overboost function increases torque (+8%) and acceleration (+6-7%). The feeling is enhanced by the car’s emotional sound from the dual muffler exhaust featuring the variable exhaust valve system. The cockpit of the i30 N shows key performance parameters through the new instrument cluster and the 8-inch free-floating screen’s modes such as the G-Force meter for live tracking of the performance. The design is based on true high-performance vehicles and includes Hyundai’s Cascading Grille at the front, aggressive-looking front and rear bumpers, and a new rear spoiler. According to the principle “form follows function”, the car design enhances aerodynamic and cooling performance. Its operation focuses on the pure connection between the car and the driver. The i30 N is built around the driver for maximum responsiveness, balanced performance and fun to drive. The i30 N loves corners. The N logo symbolises a chicane, the ultimate part of the track where the i30 N achieves maximum traction, precision and feeling. The powerful 2.0-litre turbocharged engine delivers up to 275 PS and 353 Nm torque. It offers direct response with a linear power development through the early responding turbo charger. It features front-wheel drive and a six-speed manual transmission. The i30 N’s maximum grip is guaranteed by the 18-inch Michelin or 19-inch Pirelli high-performance Hyundai N tyres. The rack-mounted motor-driven power steering is very direct and offers high precision. The lowered body is rigid and in combination with the Electronic Controlled Suspension (ECS) reduces roll and enhances cornering speed, enabling the driver to adjust the dampers from comfort-oriented daily commuting to high-performance track-driving. The i30 N is aerodynamically designed to reduce lift to keep the body firmly on to the road when maximum traction is required. The Electronic Limited Slip Differential (E-LSD) enhances grip and delivers maximum power to the road. For the real enthusiasts the Electronic Stability Control (ESC) can be switched off completely for maximum freedom. In order to give the driver and passenger the maximum comfort, the exclusively developed N sport seats offer maximum stability and lateral support in all driving situations. The i30 N is an everyday sports car, suitable for daily commuting in comfort on weekdays or for race track performance on the weekend. By offering a great variety of customisation options, the i30 N is a well-balanced hatchback, offering performance and practicality to create the best feeling for the driver. There are five drive modes, including Eco, Normal, Sport, N and N Custom settings, which can be selected by using two dedicated buttons on the steering wheel. The different modes change the character of the car, adjusting the high-performance parameters of the engine, the dampers, Electronic Stability Control (ESC), Electronic Limited Slip Differential (E-LSD), sound, steering and Rev matching. Additionally, the driver can select the Rev matching button on the steering wheel to increase the revs on the engine when shifting from a higher to a lower gear, while the car’s Launch Control helps to launch the car as easy as possible by controlling engine torque. In the development of the vehicle, durability and racetrack performance were key elements. The i30 N has undergone 10,000 km of driving on the Nordschleife at the Nürburgring circuit for durability testing. The car has also taken part twice in the world’s toughest endurance test, the ADAC 24-hours race on the Nürburgring. The engine and its components have been tested for total vehicle evaluation in 2016 and for ensuring its overall race track capability in 2017. Thus, when taking the i30 N to a track day, the driver can be sure that the car’s performance will endure. Its brakes have been developed to last with an extra cooling function through the air intakes on the front bumper. The Electronic Controlled Suspension (ECS) allows the driver to adjust the i30 N to best suit a race track’s requirements. The body’s high rigidity is increased by the rear stiffness bar behind the rear seats. The car features a strong clutch that is built to last, while the precise six-speed manual transmission has short travel to enhance fast shifting.